One of the most common series of questions we often receive from patients, especially as they approach the end of their rehabilitation cycle, is in regards to which activities or exercise routines they can safely return to. While the actual recommendation we reply with greatly depends on the individual, in one way or another the topic of “swimming” usually comes up, often because the patient has heard about how positive the effects of this are without being too hard on the joints. In this week’s blog post, we’re going to dive right into this topic and talk about why swimming might be best for you! First, let’s discuss the “weight-bearing” topic that’s frequently brought up, as a good number of patients often hear from their doctors, friends, or therapists that swimming is great for the joints. This statement is largely true! While the water provides significant resistance for your body to move against, the buoyancy of the water and non-weightbearing capacity of the activity helps provide a full-body workout without being too hard on the joints, especially of the lower body. Despite this, you’re still able to get enough resistance to build muscle and enact long-term changes to the body, due to the resistance being provided and intensity of the movements. Swimming, as a whole, is a fantastic cardiovascular exercise that utilizes the whole body in order to provide a continuous, steady workout. It’s simple enough to make it more or less challenging, due to the primary modifiers for the exercise being the intensity or distance that you swim, depending on your fitness goals. Swimming effectively challenges your arms for most swim strokes, while also utilizing your legs to assist in propelling through the water. Additionally, your core is significantly challenged by serving as a controlling stabilizer and helping to synchronize the movements of your arms and legs. By swimming, you’ll primarily help to improve the endurance levels of your muscles, while strength can also be improved depending on the intensity of swimming, as water provides significant resistance to the moving limbs. Additionally, as previously mentioned, the buoyancy of the water helps keep the activity low-impact in nature, meaning there is minimized pressure on the joints (especially of the lower body) when swimming for long periods and is often a great form of exercise for people diagnosed with arthritis as a means to stay active and healthy. 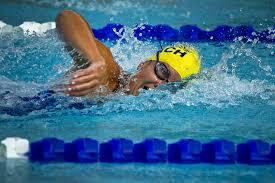 Like all cardiovascular exercises, swimming should be a pain-free and enjoyable experience. There are a number of common injuries and issues that swimmers face (with the aptly named “swimmer’s shoulder” being one), and any pain or dysfunction experienced while swimming should be taken seriously in order to help avoid future injury. Prior to initiating any serious swimming exercise, it’s recommended to undergo lessons in order to make sure your form is both safe and effective.